In October 1574, after a siege that had lasted for months and left many people starving, a young boy climbed upon the citywalls of Leiden. He saw how the Spanish soldiers had left their campements, fearing the rising water. They left, leaving everything behind. This boy, Cornelis Joppensz, ventured outside the city walls to explore the deserted army camps. He found a pot, filled with a mixture of carrots and onions, and brought it home. Ever since that day, people in Leiden eat ‘hutspot’ on the 3rd of October. And so did we…. After an eventful day on the fairground, I cooked a large pot of hutspot to end our 3 Oktober celebration in style. Hutspot is usually eaten together with meat, but I went for a vegan variety! 1 kg potatoes, 750 gr carrots, 2 medium parsnips, 3 medium onions, vegetable stock, olive oil, ground black pepper. Clean the potatoes, carrots and parsnip, chop in roughly equal cubes, cover with water and cook for about 15-20 minutes (check in between: you want to mash your veggies, not make porridge). Chop the onions and glaze them in some olive oil, and powdered vegetable stock and pepper to taste. Drain potatoes,carrot and parsnip, add onions and mash. You can make it as smooth or as lumpy as you like. Add some more oil and vegetable stock or pepper according to taste. Just fry some vegan meatballs or even falafel (did that last year..) to go with your hutspot and you’ve got yourself the vegan version of Leidens ‘signature dish’. I think it’s two years ago since I first participated in the Vegan Challenge. During the Vegan Challenge, hundreds of people sign up to eat vegan for an entire month, to share experiences and to receive tasty recipes in their inbox. The next edition starts on October 1st, over 1700 people have signed up, and I’m in! Ever since that first Vegan Challenge, I’ve started eating vegan more and more. I remember feeling like a failure when, during that first challenge, I somewhat gave up after a week or two. Nevertheless, that challenge taught me a couple of succes recipes that I still use. And over time, I tried again and again to eat 100% vegan. That, however is something I haven’t achieved as yet. I do believe a plantbased diet is better for the environment, and for a lot of animals, and I feel healthier and ‘cleaner’ when eating vegan. Participating in this next edition of the Vegan Challenge I hope will help me focus more, and be inspired to cook, bake and eat vegan more and more…..
To get in the mood, I explored the Vegan Challenge website, looking for new recipes. 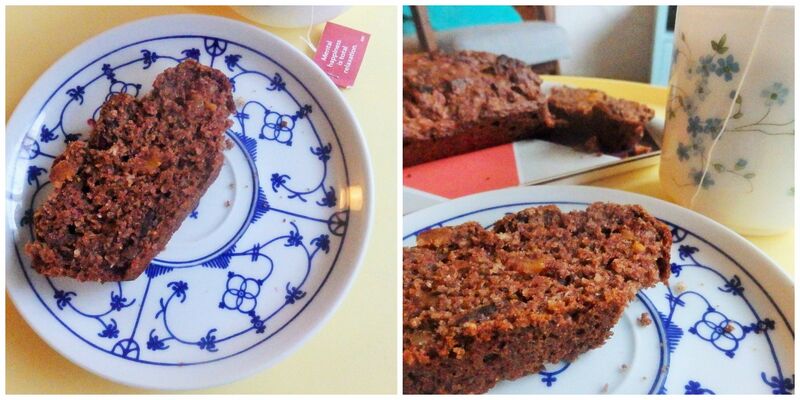 I came across a recipe for vegan banana bread (hurray! all other recipes I found contained eggs or dairy), and this was a real must try since I had a couple of brown spotty bananas waiting on the kitchen table. C. I had only 2 bananas instead of the required 3, so I adjusted the quantities of the other ingredients a bit. 250 grams of whole wheat spelt flour, 50 grams of coconut blossomsugar, 50 grams of oatmeal, 2 teaspoons of baking powder, 75 grams of chopped apricots, 75 grams of mixed nuts (walnut and pecan), 2 table spoons of cinnamon (because I looooove cinnamon, and because an extra touch of cinnamon can compensate for the lack of sugar, I hoped). 100 ml of water, 100 ml of sunflower oil, 2 ripe bananas and a teaspoon of apple cider vinegar. I added the wet ingredients to the dry ones and stirred a bit. Then I filled a small baking tray with this batter. I added some raw cocoa nibs to the rest of the batter and filled 6 cupcake molds with this. I put it all in the oven and removed the cupcakes after 25 minutes. I baked the larger cake for 40 minutes, let it cool down a bit, put the kids to bed and made myself a cup of tea…..oh boy. From now on, I know what to do with overripe bananas!